The world is an exciting place! Especially when you’ve got the keen sense of smell and energy of a Siberian Husky. A walk around the block for a husky can be like a visit to Disneyland for a child – there is so much to explore and not enough time. Huskies pull because it gets them where they want to go, faster. Huskies can be one of the more difficult breeds of dog to leash train purely because they were originally bred to pull loads. Pulling on their leash is just normal to them. Other breeds might stop pulling simply because it’s frustrating, but to huskies it’s not frustrating, it’s just life. That doesn’t make it less frustrating for you, the owner, though! Teaching your husky to stop pulling on the leash is one of the most important tasks of raising a well-behaved dog. So we know that yanking the collar or leash won’t help to teach your husky to stop pulling because they expect to drag heavy loads (which is what your yanking comes across as), and they’ll still get to their desired destination eventually. This is the key to dismantling this behaviour: don’t let them get to where they want to go. The easiest way to achieve this is to stop completely still when your dog is pulling. Don’t move at all until the leash goes slack. The dog will learn that he will only be able to move anywhere when the leash is slack. When the dog pulls, turn at 180 degrees, i.e. go back in the opposite direction. This way your energetic dog still gets to be moving, but will soon learn that pulling on the leash only results in not going where he wants to go. If the dog walks with a slack leash in that opposite direction you can reward his good behaviour by turning back to the original direction, but if he pulls again you have to turn yet again. The dog can never be rewarded for pulling by getting where he wants to go. Your dog is never a lost cause – you can teach your older husky not to pull on the leash. It is, however, far easier to teach good habits early on in the dog’s life than correcting bad behavior later. Consistency is critical when leash training your husky. Everyone in your household must use the same commands and same set of rules, or it will serve to confuse the dog, ultimately taking longer to train the dog properly. Correction collars should only be used as a last resort and with a qualified trainer. There is potential for correction collars or choker chains to backfire with huskies, causing behavioural problems such as aggression. Begin training your husky in an area with no distractions, preferably the backyard. Then move on to quiet areas of the neighbourhood or off-peak times for other walkers and dogs. Your husky needs to be able to concentrate and get the basics down pat before you take on the big wide world! Still need more help? Check out Harness and Leash Training for Siberian Husky Puppies. Harness, Leash, Or None at All?! There are options when it comes to leashes or harnesses for any dog, and, like with any dog, choosing the right one for your husky depends on the individual circumstance. When it comes to training your husky not to pull on the leash, some people suggest that a leash is better because it gives strong physical feedback. If you don’t like the idea of your dog mildly choking, however, this isn’t the school of thought for you! Harnesses have been created for exactly this reason – they allow dogs to be walked without extra pressure on their necks or tracheas. 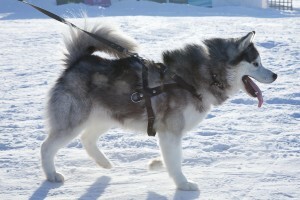 Ultimately, the best option for training a husky (or any breed, for that matter) not to pull is to opt for a harness. Not all harnesses are made equally, however. A regular walking harness has the attachment for the leash at the back, between the shoulders. Whilst it does have the benefit over a traditional flat collar and leash, it doesn’t discourage pulling. To discourage pulling, you want to find a harness that has the attachment point at the front. That’s why they’re sometimes called Anti-Pull Harnesses. The joy of the front-attachment harness is that because of the site of the attachment, the dog gets pulled around toward the person walking him if he lunges or pulls. His direction is changed, he doesn’t get to where he needs to go, and ultimately achieving the goal of teaching your dog not to pull. The harness takes care of the hard work for you! Siberian Huskies let off leash? And then there’s the big question: can you let the husky of the leash? In a nutshell – no. Not outside your own home. Huskies are a breed which are built for endurance and can hunt their prey for hours. If you’re in public and your husky takes interest in a squirrel, you may have a very hard time getting them back. If you get to the point where your husky is impeccably trained and you know you have total control to get them to obey you in an instant, perhaps then you could consider it. But if you’re only just starting to teach your husky not to pull, you’ve got a long way until you can abandon the leash all together. We have more advice in our Siberian Huskies Off Leash article. 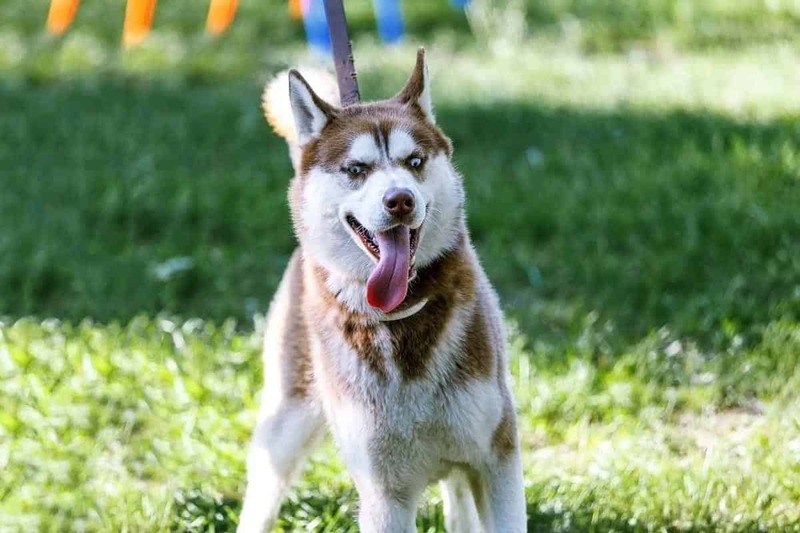 Huskies are an energetic breed that need daily exercise, teaching them to stop pulling on the lead from an early age is going to make your life as a dog owner easier and more enjoyable. They’re one of the harder breeds to teach to walk with a slack leash, but it is possible! Start from an early age, in a quiet place, with a front-attaching harness, and remember: don’t let him get to where he wants to go. Your husky will probably never be able to go off the lead in a public place, so getting him to walk with a slack leash is essential! Still need more help getting your dog to behave on the leash? Also have a look at Snowdog Guru’s article for more training tips, or this ASPCA article on holding a leash.